Breakfast is the first meal of a day. The word in English refers to breaking the fasting period of the prior night. 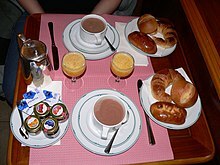 There is a strong tendency for one or more "typical", or "traditional", breakfast menus to exist in most places, but the composition of this varies widely from place to place, and has varied over time, so that globally a very wide range of preparations and ingredients are now associated with breakfast. The Old English word for dinner, disner, means to break a fast, and was the first meal eaten in the day until its meaning shifted in the mid-13th century. It was not until the 15th century that “breakfast” came into use in written English to describe a morning meal,:6 which literally means to break the fasting period of the prior night; in Old English the term was morgenmete meaning "morning meal." While breakfast is commonly referred to as "the most important meal of the day", some epidemiological research indicates that having breakfast high in rapidly available carbohydrates increases the risk of metabolic syndrome. Present professional opinion is largely in favor of eating breakfast, but some contest the positive implications of its "most important" status. The influence of breakfast on managing body weight is unclear. Most Egyptians begin the day with a light breakfast. Ful medames (dish of cooked fava beans), one of Egypt's several national dishes, is typical. 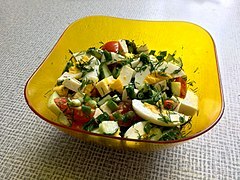 It is seasoned with salt and cumin, garnished with vegetable oil and optionally with tahini, chopped parsley, chopped tomato, garlic, onion, lemon juice, chili pepper and often served topped with a boiled egg. It is scooped up and eaten with the staple whole wheat pita bread called Eish Masri or Eish Baladi (Egyptian Arabic: عيش [ʕeːʃ]; Modern Standard Arabic: ʿayš) and usually accompanied by taʿamiya (Egyptian Arabic: طعمية‎) which is the local variant of falafel made with fava beans, fresh cut homemade French fries and various fresh or pickled vegetables (called torshi). Several kinds of cheeses are popular, including gebna bēḍa or Domyati cheese, gebna rūmi (Roman cheese) which is similar to Pecorino Romano or Manchego, and Istanbuli cheese (a brined white cheese with peppers added to the brine which makes it spicy). Fried eggs with pastirma is also common breakfast foods in Egypt. Breakfast (quraac) is an important meal for Somalis, who often start the day with some style of tea (shaah). The main dish is typically a pancake-like bread (canjeero, canjeelo). It might also be eaten with a stew or soup (maraq). Lahoh is a pancake-like bread originating in Somalia, Djibouti and Yemen. It is often eaten along with honey and ghee or beef jerky (muqmad), and washed down with a cup of tea. During lunch, lahoh is sometimes consumed with soup or stew. Lablabi is a common and popular breakfast stew. In Uganda, most tribes have different cuisines but the most popular breakfast dishes are Porridge and Katogo. Porridge is made by mixing maize flour or millet flour with water and bringing the mixture to a boil. While Katogo is made from matoke (green bananas), peeled and cooked in the same pot with a sauce (Beef, peanuts, beans or greens), Katogo is served with tea or juice. Both dishes are popular in all regions of Uganda. Breakfasts vary widely throughout Asia. In Arab countries, breakfast is often a quick meal, consisting of bread and dairy products, with tea and sometimes jam. Flat bread with olive oil and za'tar is also popular. As mainland China is made up of many distinct provinces, each with their own unique cuisine, breakfast in China can vary significantly from province to province. In general, basic choices include sweet or salty pancakes, soup, deep-fried bread sticks or doughnuts (youtiao), buns (mantou), porridge (congee), and fried or soup-based noodles. These options are often accompanied by tea or sweetened soybean milk. 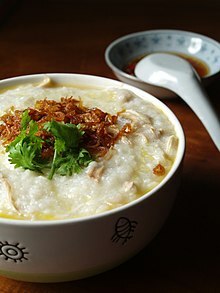 However, condiments for porridge and the soup base tend to vary between provinces and regions. The types of teas that are served and spices that are used can also differ significantly between the provinces. Due to its near two centuries history as a British colony and proximity to China's Canton region, both English and traditional Cantonese style breakfasts are of somewhat equal popularity in Hong Kong, as well as the hybrid form of breakfast commonly offered in Cha chaan teng. Cha Chaan Teng breakfasts often include Hong Kong-style milk tea, pan fried egg, bread, Cantonese noodles or Hong Kong style macaroni in soup. Traditional Cantonese breakfast may include dim sum, which include a variety of different ingredients and are prepared in numerous different forms from delicately wrapped baby shrimp steamed dumplings to sweet water chestnut cake. Each dish is designed to be sampled and diners can go through a large selection of dim sum quickly accompanied by a generous amount of good tea. Tieguanyin is the most common accompaniment, but other teas such as pu'er and oolong are also common. Fried and rice-based noodles and cakes are also popular. In modern times, dim sum is commonly prepared and served in Yum Cha restaurants rather than at home because of the skill and efforts involved in the preparation. The typical Bangladeshi breakfast consists of flour-based flat breads such as chapati, roti or paratha, served with a curry. Usually the curry can be vegetable, home-fried potatoes or scrambled eggs. The breakfast varies according to location and the eater's income. In villages and rural areas, rice is mostly preferred by day labourers. In the city, sliced bread with jam or jelly is chosen due to time efficiency. In Bangladesh tea is preferred to coffee, and is an essential part of most breakfasts. Having toasted biscuits, bread or puffed rice with tea is also very popular. In all, there are at least 25 types of Indian breakfasts, each consisting of a choice of over 100 different food items. Each state in India has different specialties and items for breakfast. Thus there is no single standard Indian breakfast, with items changing with regions. However, one can broadly classify breakfast varieties in India into two types: North Indian and South Indian. The eastern and western parts of India also have individual breakfast items unique to their cultures and states. A typical south Indian breakfast consists of idli, vada or dosa coupled with chutney and sambar. Many variations of these dishes exist such as rava idli, thayir vadai (yogurt vada), sambar vada and masala dosa. Other popular south Indian breakfast items are pongal, bisibelebath (sambar rice), upma, and poori. The state of Kerala has some special breakfast items such as appam, parotta, puttu, idiyappam and palappam. A typical north Indian breakfast may either be a type of paratha or roti served with a vegetable curry, curd and pickles. There are several varieties of parathas available depending on the type of stuffing such as aloo paratha, paneer (cottage cheese) paratha, mooli paratha (radish paratha), etc. Other popular breakfast items in the north are poori bhaji, poha and bhindi bhujia. Among Bengals roti and curry are the general variants in breakfast. The menu may also include "Indian French toast" which is also known as "Bombay toast", chire bhaja (flaked rice fried in oil with salt added to taste), and boiled eggs. 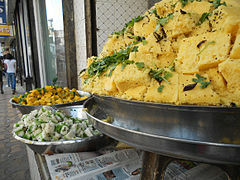 In Western India, a Gujarati household may serve dhoklas, khakhras or theplas for breakfast, the most popular of which is methi thepla. In Mangalore the breakfast dish oondees may be served. In Maharashtra, the typical breakfast (nashta) consists of kande pohe, upma, ukkad, and thalipeeth. Sometimes chapati bhaji or a chapati roll with tea becomes breakfast. Breakfast in Iran generally consists of different kinds of flatbread such as barbari, taftoon, sangak, lavash, white cheese, butter, jam and marmalade (morabba), honey, clotted cream (sar sheer), nuts and fresh/dried fruits, and black tea or coffee. Frequently breakfast can be as simple as butter and jam on bread with tea. Iranians prefer to drink their hot black tea with sugar. Traditional cooked dishes for breakfast include haleem (wheat and chicken/lamb/turkey porridge eaten with cinnamon) or kale pache (sheep's feet, stomach and other offal), adasi (green lentil soup), fried/boiled/soft-boiled eggs, omlet (eggs cooked in tomato sauce). 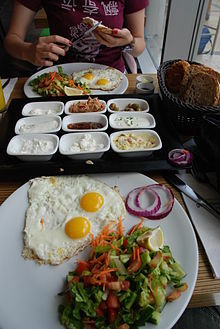 The Israeli breakfast is a mix of culinary influences from eastern Europe, agrarian Yishuv culture, North African cuisine and Levantine cuisine. It usually consists of a range of cheeses along with sliced vegetables, scrambled eggs (or another kind of fried egg)  and bread, served with spreads like butter, jam or honey. The most commonly used vegetables are cucumbers, tomatoes, and red bell peppers; carrots, onions and radishes may also be included. Cheeses include, at the very least, cottage cheese, quark or fromage blanc, and a local variety of Edam ("yellow cheese"), and often Tzfatit and labneh too. Side dishes including pickled olives and herring may also be served. Typical Middle Eastern mezze such as Israeli salad, hummus, tehina and baba ghanoush, as well as Shakshouka and a variety of salads may be served. The meal is most often accompanied by coffee, tea and orange juice. A typical Israeli meal could be either dairy- or meat-based, but not both. Only certain types of meat are considered kosher. Breakfast in modern Japanese households comes in two major variations: Japanese style and Western style. Japanese-style breakfasts are eaten widely in Japan, but often only on weekends and non-working days. Younger Japanese couples may prefer Western-style breakfasts because they are generally less time consuming to prepare. 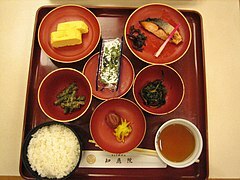 The standard Japanese breakfast consists of steamed white rice, a bowl of miso soup, and Japanese styled pickles (like takuan or umeboshi). A raw egg and nori are often served; the raw egg is beaten in a small bowl and poured on the hot rice to make golden colored tamago kake gohan, whilst the nori (sheets of dried seaweed) is used to wrap rice. Grilled fish and Japanese green tea are often served as well. Western-style breakfasts in Japanese households are similar to those in the United States. Japanese children often eat corn flakes and drink milk, hot chocolate or fruit juice. Japanese adults (especially younger ones) tend to have toast with butter or jam, eggs, and slices of vegetables. They often drink coffee or orange juice. Traditional Japanese inns (like ryokan) serve complete traditional breakfast. Western-style hotels and restaurants in Japan generally offer a mix of the Western and Japanese styles. Traditionally, Korean breakfasts consist mainly of rice and soup dishes. These can include small amounts of fish or beef, and some form of broth, stew or porridge. Like all Korean meals, breakfast is usually served with banchan, or side dishes consisting of kimchi, Gyeran-jjim (steamed eggs) and tofu. In Burma the traditional breakfast is htamin jaw, fried rice with boiled peas (pè byouk), and yei nway jan (green tea), especially among the poor. Glutinous rice or kao hnyin is steamed and wrapped in banana leaf often served with peas as kao hnyin baung with a sprinkle of crushed and salted toasted sesame. Equally popular is the purple variety of rice known as nga cheik which is cooked the same way and called nga cheik paung. Si damin is sticky rice cooked with turmeric and onions in peanut oil which is served with crushed and salted toasted sesame and crisp fried onions. Assorted fritters such as baya jaw (urad dal) are often served as a complement. Nan bya or naan (Indian-style flatbreads) again with pè byouk or simply buttered, is served with Indian tea or coffee. It goes well with hseiksoup (mutton soup). Fried chapati, blistered like nan bya but crispy, with pè byouk and crispy fried onions is a popular alternative. Htat ta ya, lit. "a hundred layers", is flaky multi-layered fried paratha served with either pè byouk or a sprinkle of sugar. Eeja gway (Chinese-style fried breadsticks or youtiao) with Indian tea or coffee is another favourite. Mohinga, perhaps the most popular of all, now available as an "all-day breakfast" in many towns and cities, is rice vermicelli in fish broth kept on the boil with chickpea flour or crushed toasted rice, lemon grass, sliced banana stem, onions, garlic, ginger, pepper and fish paste and served with crispy fried onions, crushed dried chilli, coriander, fish sauce and lime. Add fritters such as split chickpea (pè jan jaw), urad dal (baya jaw) or gourd (bu jaw), boiled egg and fried fish cake (nga hpè jaw). A typical Filipino breakfast usually includes fried egg, either scrambled or sunny side-up, tocino, dried fish called tuyo, tapa, and fried rice, usually seasoned with garlic. They are usually served at seven in the morning due to school classes starting relatively early. If main breakfast is not cooked or is unavailable, a bread called pandesal is eaten instead, with cheese, peanut butter, jam, or kesong puti as spread. A traditional Singaporean breakfast contains kaya toast (coconut milk jam with bread), half-boiled eggs and Kopi. Locals usually dip the toast into the eggs mixed with soya sauce and pepper. In Turkish cuisine, a typical breakfast consists of bread, cheese (beyaz peynir, kaşar etc. ), butter, olives, eggs, tomatoes, cucumbers, jam, honey, and kaymak. Sucuk (spicy Turkish sausage), pastırma, börek, simit, poğaça and soups are eaten as a morning meal in Turkey. A common Turkish specialty for breakfast is called menemen, which is prepared with tomatoes, green peppers, onion, olive oil and eggs. Various soups (çorba) are also very common and traditional for Turkish breakfast; mainly chicken broth, lentil soup, and a national delicacy, tarhana soup (Turkish cereal food consisting of flour yogurt and vegetables fermented then dried; it is consumed as a soup by mixing it with stock or water) are most well known soups. Tripe soup, trotter soup, sheep's head soup are also traditionally very common all over Turkey for breakfast. The Turkish word for breakfast, kahvaltı, means "before coffee," (kahve, 'coffee'; altı, 'under'). but since after the First World War, during which the Ottoman Empire lost its coffee-producing territories, tea has displaced coffee as the everyday hot drink in Turkey. In Sirkeci district of Istanbul, Pide is a popular morning meal. Prior to the Second World War and the widespread adoption of household refrigerators, the traditional Australian breakfast consisted of grilled steaks and fried eggs, mainly because of the ready availability of beefsteak during that period. Although this is still eaten in the bush, very few urban Australians today would recall this breakfast format. The majority of urban Australians eat commercially prepared cereal with pasteurised milk or yogurt and toast with preserves such as marmalade or vegemite for breakfast. Two of the most common cereals are cornflakes and a type of biscuit made from compressed toasted flakes of wheat, called Weet-bix. Fruit is also common at breakfast, either on the cereal or eaten separately. While not unusual, a cooked breakfast is more likely to be eaten on weekends or on special occasions either at home or at a café. A cooked breakfast can include sausage, bacon, breakfast steaks, mushrooms, tomato, hash browns and pancakes, similar to both the British and American cooked breakfast. Breakfast habits differ more between age groups or families than between cities. In ethnically Fijian villages, breakfast may be tea served with milk and sugar, and food made out of flour: tovoi or babakau (a type of fried dough), pancakes, bread or biscuits with butter. Sometimes a starch, such as cassava, taro in coconut milk, or rice, is served instead. Leftover fish or meat from the previous night's meal may be served as well. Tea made from lemon leaves (called draunimoli) and fruits such as pineapple, banana, papaya, plantain, and watermelon are also occasionally served. 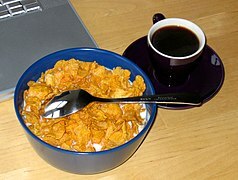 In urban households, tea and cereals are often consumed. Breakfast foods eaten by Fiji Indians often include a vegetable curry with roti and sometimes differ from the above. Fijians living in Rotuma sometimes eat nuqa fish in tarotaro (fermented coconut yogurt), with fresh tropical fruits. Breakfast in New Zealand is very similar to the Australian breakfast. The range of processed breakfast cereals is vast and children are more likely to eat those that contain added sugar. New Zealanders, particularly in winter, are likely to eat a hot oat cereal called "porridge". Porridge is typically served with milk, sugar, fruit or yogurt. Sliced bread which has been toasted and topped with preserves or spreads is a common alternative breakfast. Eating breakfast at a restaurant was unheard of until the 1990s; however cafes which serve breakfast until midday or all day are now common. The Big Breakfast is the main item at cafes, which is similar to the British cooked breakfast, except that it seldom includes black pudding. Other common menu items are: eggs done how you like, eggs benedict, beans on toast, pancakes, cereal and yogurt, and smoothies. Breakfast nearly always includes coffee, tea or both, with children drinking milk either on their cereal, in a glass or hot milo. Recent concern has been raised about the cost of milk and some families being unable to afford it. A fast food franchise, McDonald's New Zealand offers a "kiwi big breakfast" which includes two sausages, hash brown, scrambled eggs, toasted muffin and choice of a small Filter coffee, Hot chocolate or tea. Some NGOs and charities, such as the New Zealand Red Cross, provide breakfast to underclass primary school children. Survey results released in 2013 claim that nearly half of all New Zealanders skip breakfast at least once a week with almost a third of those skipping breakfast up to three times a week. According to Merriam-Webster, a continental breakfast usually includes coffee, jam, fruit, and baked goods such as bread and pastries, items chosen because they are shelf-stable, and can be served in portion sizes that are appropriate for large groups of people. The term originated in Britain in the mid-19th century, first used in 1896 public hygiene book The Sanitarian, in which "continent" refers to the countries of mainland Europe, though the idea had been around for a few decades as American hotels endeavored to appeal to the changing tastes of the emerging middle class and European travelers visiting America. 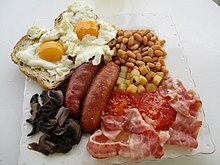 The term refers to the type of breakfast found in places such as France and the Mediterranean, which is lighter and more delicate than the typical full English breakfast, which tends to consist of a large plate of eggs, bacon, sausage, toast, beans, and roasted mushrooms and tomatoes, and American breakfasts featuring eggs, breakfast meats, pancakes, potatoes, and toast. Continental breakfasts are also more cost-effective for the establishments serving them, because they require less staff to prepare them. In southeast Europe, in countries such as Bulgaria, Bosnia, Montenegro, Macedonia and parts of Croatia breakfast usually consists of various kinds of savory or sweet pastry, with cheese, meat or jam filling. The most typical breakfast consists of two slices of burek and a glass of yogurt. Breakfast also often consists of open sandwiches. The sandwich is buttered (with margarine), with toppings such as prosciutto and yellow cheese. In Albania the breakfast often consists of a scone, milk, tea, eggs, jam or cheese. Meat is not preferred during the breakfast and it is usually substituted for seafood such as canned sardines or tuna which is typically served with condiments such as mustard or mayonnaise. Wholegrain cereals and pastries are mostly consumed by children. A shot of raki may be added to coffee as in the Italian Caffè corretto. A typical breakfast in Denmark consists of slices of rye bread ('rugbrød') with yellow cheese, a soft-boiled egg – or more rarely – ham, salami or liver spread ('leverpostej') or it may consist of breakfast cereals such as oatmeal, corn flakes, yogurt being popular options. White bread or bread rolls (rundstykker) with yellow cheese and different kinds of jams, usually made from berries or citrus fruits, and other toppings, accompanied by coffee, or tea. Weekends or festive occasions may call for Danish pastries (wienerbrød), chocolate, or a bitters, such as Gammel Dansk. The typical German breakfast consists of bread or bread rolls, butter, jam, ham, cheeses, meat spreads, cold cuts, hard- or soft-boiled eggs and coffee or tea. Cereals have become popular, and regional variation is significant. Yogurt, granola and fruit (fresh or stewed) may appear, as well as eggs cooked to order (usually at smaller hotels or bed-and-breakfasts). A second breakfast is traditional in parts of Germany, notably Bavaria where it is called Brotzeit (literally "bread time"). In Hungary people usually have a large breakfast. Hungarian breakfast generally is an open sandwich with fresh bread or a toast, butter, cheese or different cream cheeses, túró cheese or körözött (Liptauer cheese spread), cold cuts such as ham, liver pâté (called májkrém or kenőmájas), bacon, salami, beef tongue, mortadella, disznósajt (head cheese), different Hungarian sausages or kolbász. Even eggs (fried, scrambled or boiled), French toast called bundás kenyér and vegetables (like peppers, bell peppers, tomatoes, radish, scallion and cucumber) are part of the Hungarian breakfast. Sometimes breakfast is a cup of milk, tea or coffee with pastries, bread rolls or crescent-shaped bread (kifli), toast, pastries with different fillings (sweet and salty as well), butter, jam or honey and a bun or a strudel or cereal like muesli, yogurt, kefir and perhaps fruit. The traditional breakfast in Italy simply consists of a caffè latte (hot coffee with milk) with bread or rolls, butter and jam – known as prima colazione or just colazione. Fette biscottate (a cookie-like hard bread often eaten with hazelnut chocolate spread or butter and jam) and biscotti (cookies) are commonly eaten. Hot coffee may be sometimes replaced by hot tea, depending on personal taste. Children often drink hot chocolate, plain milk, hot milk with barley coffee, or hot milk with very little coffee. Cereals, yogurt and fruit juices are also common. If breakfast is eaten in a bar (coffee shop), it is composed of cappuccino and cornetto (frothed hot milk with coffee, and a pastry). For breakfast, the Dutch and Belgians typically eat sliced bread with butter or margarine and various choices of toppings: dairy products (numerous variations of cheese), a variety of cured and sliced meats, or sweet or semi-sweet products such as jam, syrup (from sugar beets or fruit), honey, Kokosbrood (a coconut product that is served thinly sliced like sliced cheese) or peanut butter. Another type of sweet toppings are the chocolate toppings; the Dutch have chocolate toppings in all variations: hagelslag (chocolate sprinkles), chocoladevlokken (chocolate flakes) (both typically Dutch), and chocoladepasta (chocolate spread). Tea, dripolator coffee, milk, and juice are the most popular breakfast beverages. Breakfast may also include raisin bread and fried or boiled eggs. On special occasions, such as Easter, Christmas, Mother's Day etc., breakfast is usually the same, but with a wider range of choices (i.e. premium cheeses, special ham, hot buns, croissants etc.). A 2012 opinion poll concluded that the Dutch believe that breakfast should be a more important meal than it is and that more time should be spent on it; almost three-quarters of those polled ate their sandwiches in less than fifteen minutes, and blame for an all-too quick breakfast was placed on "fast" breakfast products. A perfect "weekend breakfast" for the Dutch contained coffee or tea, fresh-baked bread rolls (and croissants), and a boiled egg. The poll also concluded that men are more interested than women in having breakfast with their partner. 80% of Norwegians eat breakfast (frokost) daily, mostly at home. The most common breakfast is open sandwiches (smørbrød), often whole wheat bread, with cheese, often Jarlsberg, Norvegia or brunost, cold cuts, leverpostei, jam etc. Common drinks are water, various types of coffee such as French press, cafe latte or espresso, milk and juice. Another common breakfast is breakfast cereals like corn flakes eaten with milk, kulturmelk or yogurt. Whole-grain porridges with regular milk or butter are also eaten by some. More ample breakfasts may include fish, a diverse array of cheese, eggs, bacon, breads, and hot and cold cereals eaten in various combinations. Pastries such as croissants or pain au chocolat have become increasingly common since the 1990s. The traditional Romanian breakfast is milk, tea or coffee alongside (toasted) bread with butter or margarine and on top of it, honey or fruit jams or preserves. Sometimes the buttered bread is served savory instead of sweet, in which case the Romanians add cured meats, salami or cheese. 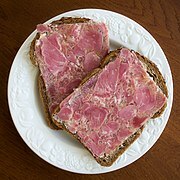 Another option is to spread on a slice of bread some liver pâté. In recent years, Romanians have also started to serve cereal with dried fruits and milk instead of the traditional breakfast, though that is not yet very widespread. According to a 2014 study, 35% of Romanians eat cooked dishes such as omelet or fried eggs and 15% eat sandwiches. Most people drink coffee and 67% serve Turkish coffee (made in an ibrik), though more and more people are starting to use drip or filter coffee. While crêpes served with fruit preserves, jams or cheese have traditionally been served as desserts, in the recent years more Romanians have started to have them as breakfast during weekends. Traditional Russian breakfast are concentrated on kashas, or porridges – the most important staple in Russian nutritional culture, with buckwheat and oat, as well as semolina, serving as the three most important bases of such dishes, usually cooked on water or milk, as well as consumed with or without milk. Breakfast foods also include pancakes or oladushki. Oladushki are made from flour and rise on yeast. Blini, or crepes, are also popular for breakfast and are also made with flour, but without the yeast. Sirniki, is a cheese form of pancake. Sirniki are made of tvorog (quark cheese), which can be eaten separately with honey for breakfast. Also, a popular dish is buterbrod, open sandwiches with cold cuts and cheeses. In Serbia, breakfast may include eggs in different forms (e.g. omelet with bacon, onion and feta cheese), canned fish or opened sandwiches with prosciutto or ham, feta cheese and salad (e.g. pickles). Different types of pies and pastry with various filings (e.g. proja, gibanica, burek) are also served as the main dish. Yogurt and coffee are preferred breakfast drinks. In Central Spain there is a special breakfast 'known as chocolate con churros – hot chocolate with Spanish-style fritters, which are extruded sticks of doughnut-like dough with a star-shaped profile covered in sugar. The chocolate drink is made very thick and sweet. In Madrid, churros are somewhat smaller and shaped like a charity ribbon. [clarification needed] This meal is normally served in cafeterías but it is not a regular or usual breakfast at Madrid homes. The usual one is the same as in the rest of Spain: coffee with milk or Cola Cao, orange juice, biscuits or toasts, with butter and jam. In the North, East and West it is more common to have a cup of coffee (usually with milk) or Cola Cao and a toast with a choice of olive oil and salt, tomato and olive oil, butter, jam, pâté, jamón serrano (cured ham), and other options like sobrasada (a raw cured spiced sausage that is easy to spread), and in Andalucia, pringá. Freshly squeezed orange juice is widely available in most places as an alternative for coffee. The breakfast is not often larger than these two items, because usually in late morning there is a break known as almuerzo when there is a snack. Sometimes, toast is replaced with galletas (a type of cookie made with flour, sugar, oil and vanilla flavour), magdalenas (a Spanish version of the French madeleine made with oil instead of butter) or buns. Breakfast in Sweden is usually an open sandwich of soft bread or crisp bread, cold cuts, smörgåskaviar, cheese, cottage cheese, cream cheese, eggs, scrambled or boiled, pâté (leverpastej) with pickled cucumber, tomatoes or cucumber, or a toast with marmalade or maybe honey, juices, coffee, hot chocolate or tea. Breakfast cereals or muesli with milk, yogurt or filmjölk, currants and fruits are popular or warm whole-grain porridge with milk and jam (for example lingonberry jam). Bilberry-soup (blåbärssoppa) and rose hip soup are also possible breakfast alternatives. Swiss breakfasts are often similar to those eaten in neighboring countries. Traditionally, zopf (or züpfe) is eaten on Sunday mornings and New Year's Day. A notable breakfast food of Swiss origin, now found throughout Europe, is muesli, (Birchermüesli in Swiss German), introduced in 1900 by Maximilian Bircher-Benner for patients in his hospital. In the contemporary UK and Ireland, a weekday breakfast may involve a cereal dish, such as muesli, porridge or cereal, or toast or simply bread spread with jam or marmalade. Tea and coffee remain equally popular accompaniments. Marmalade, originally a Portuguese confection, had been a popular British spread to consume in the evening, before the Scots moved it to the breakfast table in the 18th century. It is however becoming very common to 'skip breakfast' entirely or take coffee or pastries on the morning commute. Portable quick snacks such as granola bars, ready-cut fruit and warm takeaway foods are becoming increasingly commonly consumed away from home and are sold at commuting points and newsagents and local shops in all urban areas. The traditional breakfast most associated with Britain and Ireland remains, however, the full breakfast of eggs (fried, scrambled, or poached) with bacon and sausages, usually with mushrooms, tomatoes, baked beans, fried bread, black pudding or white pudding and toast. Dating from a time when hard labour was more common, calorie intakes were necessarily higher, and servant labour was more available, it is nowadays regarded as a meal for the weekend or holidays when time is available for preparation, prepared by parents to welcome children, or as a special occasion such as a birthday or anniversary, or following a night of drinking. A healthy and nutritious version consists of grilling the protein and using poached, rather than fried, eggs, and variations based on one egg, one protein and toast abound. It remains by far the most common choice on brunch menus and breakfast cafes across the region. The "full Scottish breakfast" tends to omit pork sausages and have beef sausages or lamb haggis instead. At its most extensive it consists of eggs, square sausage, fried dumpling, potato scone, tomato, mushrooms, bacon beef links and fried bread. Originating in the British isles during the Victorian era, the full breakfast is among the most internationally recognised British dishes. Another traditional British breakfast consists of porridge, although now associated with Scotland, it has been consumed across Britain as a staple food since at least the Middle Ages. The breakfast cereal Scott's Porage Oats was produced in Glasgow in 1880. Before the arrival of American-style breakfast cereals in the early 20th century, dried bread soaked in hot milk or tea and porridge (boiled oats) was the common daily breakfast, while leftover vegetables (often, cabbage) and potatoes not eaten the night before were often served re-fried becoming 'bubble-and-squeak'; in Ireland the dish is known as colcannon. Traditionally, breakfast would be served with a small amount of fruit, such as a slice of orange, believed to prevent the onset of scurvy. Also traditional, but now less popular breakfasts included fish in the form of kippers (smoked herring) with poached egg and toast, and kedgeree (a Scoto-Indian smoked haddock, egg and rice dish originating in Colonial India). Most British breakfasts are consumed with tea, coffee or fruit juice. In Old English, breakfast was known as morgenmete, meaning "morning meal". A continental breakfast in UK and Irish hotels normally consists of baked goods (fresh bread, toast, pastries such as croissants or pain au chocolat etc.) slices of cheese and cold meat, cereal, yogurts, fruit and drinks like coffee, tea or fruit juices. Although this is the traditional breakfast in parts of continental Europe, elsewhere these breakfasts are common only in the hospitality sector (particularly in economy and limited service hotels with no restaurant, as they require little preparation). As with other continents around the world, breakfasts in North America vary widely from country to country. Breakfast in Canada is similar to that of the US. Traditional breakfast foods include pork sausages or bacon, fried potatoes, eggs, toast, cereals, pancakes (or French toast) and maple syrup, or hot oatmeal. Coffee, tea and fruit juice of many varieties are widely consumed in Canada during breakfast. In Costa Rica the most common breakfast is called "gallo pinto," which basically is made up of rice and beans (red or black) previously cooked. Sautéed in a pan with chile, onions, culantro (an herb typical to the region) and bean stock for color. It is accompanied with fried egg, cheese and fried plantain or cooking plantain. Black coffee as well as with milk are traditional drinks. As this is the most common breakfast of the country, in Limón Province they prepare gallo pinto with coconut milk instead. Another popular breakfast food is the "chorreadas" which are basically savory sweet corn pancakes; they are usually accompanied with cheese or a type of sour cream called "natilla". Breakfast in urban areas traditionally consists of café con leche that is sweetened and includes a pinch of salt. Toasted buttered Cuban bread, cut into lengths, is dunked in the coffee. In rural Cuba, farmers eat roasted pork, beans and white rice, café con leche and cuajada sweetened with caramel. In the Dominican Republic, breakfast varies depending on the region. In the interior of the island it is accustomed to have breakfast with a side of vegetables, the green plantain or cooking plantain being the most popular. It is served boiled or mashed known as Mangú. In the capital, breakfast is more light. It includes coffee with milk or hot chocolate, along with bread, butter and cheese. Normally accompanied by orange juice and other juices of fruits typical to the region. Milk punch (milk, egg, nutmeg and malt) boiled eggs with "harina de negrito" or some other type of cornstarch. Traditional breakfast bread is a water-based bread. In Guatemala, breakfast consists of one or two eggs either fried, scrambled or boiled accompanied by baked/fried beans with coffee. With this comes fresh cream, fresh cheese and fried plantains (or cooking plantain). It is common to add hot sauce made out of "chiltepes" (a type of pepper). They are prepared raw or boiled, then they are ground with some vinegar, chopped onions and chopped cilantro to make the hot sauce. A traditional egg dish prepared with both green and red sauces is called "huevos divorciados." In the eastern part of the country, specifically in Zacapa you can find "huevos a caballo" or (eggs on a horse) which is basically two fried eggs over roasted steak. Other types of breakfast include milk cereals. The most common drinks are orange juice or other fruits, milk, atol (a milk pudding with chocolate) and corn starch. The coffee is normally served with sweet bread also called "pan de manteca" (or butter bread). In Honduras it is typical to start the day with homemade bread, with coffee or a glass of milk. Then, a plate of food with beans, alongside eggs that can be scrambled or sunny side up, slivers of fried plantain (or cooking plantain), corn, tortillas, cheese and butter. Versions of egg preparation vary: "estrellados" which consists of just cracking the shell, in "torta" or omelette (beaten with some salt), scrambled or boiled. Another typical breakfast are the baleadas and tortillas with cheese; sometimes they are fried together with cheese in between. In the "garífuna" culture, coffee is accompanied by "mínimo" bread (banana bread) or coconut bread. A traditional Mexican breakfast consists of eggs prepared in different ways (like Huevos rancheros), accompanied by beans with chile and tortillas. Also very traditional are chilaquiles (pieces of corn tortilla with a cheese and chile sauce) and entomatadas (a variation of the spicy enchiladas). In Nicaragua the typical breakfast consists of "gallo pinto" (national dish made out of red beans and rice), eggs, cheese, corn tortillas and sweet plantains. Meals are normally accompanied by different juices and coffee. On Sundays, nacatamales are the traditional breakfast. These consist of a mass of corn with rice, potatoes, pork or chicken and sliced onions wrapped in plantain leaves and is usually accompanied by cacao as a drink. In Panama, breakfast is a heavy meal, especially in the interior of the country where hard labor requires it. It always includes black coffee (tinto) or with milk (called pintado) with any of these sides: corn tortillas, traditional white cheese (or queso del pais), another type of tortillas or "torrejas" made of wheat flour known as "hojaldres." Another traditional breakfast side is "bollo" made out of either corn, white corn, or coconut that is wrapped in corn leaves and "preña'o" (meaning with child) that means it's filled with some type of meat. As protein, a large serving of beef liver with onion, scrambled or fried eggs, beef stew or "tasajo" (a type of beef jerky), pork rinds and different kinds of sausages like chorizo or morcilla are the most popular. These are also accompanied by: slices of green plantain or cooking plantain, "patacones" (double fried plantain), carimañolas (yuca filled with meat), as well as different bread pastries both savory and sweet. These large breakfasts are normally reserved for special occasions while everyday breakfasts consist of more traditional food from the west like toast, ham, cheese, jam etc. The average starting time for breakfasts in the United States has been found to be 8:12 a.m, and varies from 8:08 a.m. in the South to 8:17 a.m. in the West. Breakfast often consists of a combination of hot or cold cereals, eggs, breakfast meats, and breakfast quick breads such as pancakes, waffles, or biscuits. Variants of the full breakfast and continental breakfast are also common. In the Southeastern United States, grits, and biscuits and gravy are popularly eaten at breakfast. In many regions around the country, bagels are a common breakfast item, and are often served sliced in half, toasted, and spread with butter or cream cheese or other toppings. Another popular breakfast item in the United States are doughnuts, which are often consumed exclusive of other breakfast foods. Coffee is a common beverage, as is tea, and orange juice, tomato juice, and other fruit juices are consumed by people of all ages. In the United States, 65% of coffee is drunk during breakfast hours. Milk is also widely consumed, drunk either plain or prepared with various flavorings, such as chocolate or strawberry. Across the country, breakfast sandwiches are a common choice for the first meal of the day. A typical sandwich is composed of egg, cheese, and cooked breakfast meat such as bacon or sausage, on a roll, although regional varietals are common. In New Jersey, bacon is often swapped out of the breakfast sandwich and replaced with a processed meat called pork roll (also known as Taylor Ham). Other areas alter the breakfast sandwich medium with regional favorites: in New York, bagels are popular, and in the South, biscuits. A variation is the breakfast burrito, which originates from Southwestern and Tex-Mex cuisines. In Argentina, breakfast is simple: tostadas or medialunas, usually served with coffee and orange juice. Breakfast in Brazil tends to be lighter as "Brazilians consider lunch to be a more important meal". It is called Café da Manhã in Portuguese, which translates to “morning coffee”, and consists of a combination of bread, fruits, cheese, cereal, pão de queijo, cakes, coffee, milk, and fruit juice. Regional differences also exist. 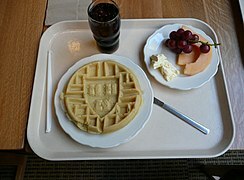 A breakfast consisting of a novelty-stamped waffle, cantaloupe melon slices, grapes, and butter. ^ "Breakfast – definition of breakfast". Free Online Dictionary, Thesaurus and Encyclopedia. 2012. Retrieved 28 March 2012. ^ Albala, Ken (2002). Hunting for Breakfast in Medieval and Early Modern Europe. Devon, UK. ^ "Breakfast". Etymonline.com. Retrieved 2 February 2013. ^ a b Giovannini M, Verduci E, Scaglioni S, Salvatici E, Bonza M, Riva E, Agostoni C (2008). "Breakfast: a good habit, not a repetitive custom". J Int Med Res. 36 (4): 613–24. doi:10.1177/147323000803600401. PMID 18652755. ^ Maki KC, Phillips-Eakley AK, Smith KN (2016). "The Effects of Breakfast Consumption and Composition on Metabolic Wellness with a Focus on Carbohydrate Metabolism". Adv Nutr. 7 (3): 613S–21S. doi:10.3945/an.115.010314. PMC 4863265. PMID 27184288. ^ Carroll AE (23 May 2016). "Sorry, There's Nothing Magical About Breakfast". The New York Times. Retrieved 23 May 2016. ^ Leidy HJ, Gwin JA, Roenfeldt CA, Zino AZ, Shafer RS (2016). "Evaluating the Intervention-Based Evidence Surrounding the Causal Role of Breakfast on Markers of Weight Management, with Specific Focus on Breakfast Composition and Size". Adv Nutr. 7 (3): 563S–575S. doi:10.3945/an.115.010223. PMC 4863262. PMID 27184285. ^ Sievert K, Hussain SM, Page MJ, Wang Y, Hughes HJ, Malek M, Cicuttini FM (January 2019). "Effect of breakfast on weight and energy intake: systematic review and meta-analysis of randomised controlled trials". BMJ (Clinical Research Ed.). 364: l42. doi:10.1136/bmj.l42. PMC 6352874. PMID 30700403. ^ a b Special Events (18 July 2013). "The Art of Moroccan Cuisine – Cooking Classes in Morocco | Fes Cooking and Cultural Tours". Fescooking.com. Retrieved 23 August 2014. ^ Heltberg, Rasmus; Hossain, Naomi; Reva, Anna, eds. (2012). Living Through Crises: How the Food, Fuel, and Financial Shocks Affect the Poor. New Frontiers of Social Policy. Washington, DC: World Bank. p. 223. doi:10.1596/978-0-8213-8940-9. ISBN 978-0-8213-8940-9. OCLC 769421434. Retrieved 4 January 2013. ^ Jaffrey, Madhur (2015). Vegetarian India. New Delhi: Penguin Random House. Retrieved 28 April 2017. ^ a b Regional Indian Recipes. Jaico Publishing House. 1 January 1970. ISBN 978-81-7224-035-6. ^ "Thalipeeth". Archived from the original on 15 December 2014. Retrieved 15 December 2014. ^ Gagnon, Lynn (15 May 2016). "The Israeli breakfast – Best in the world!". BonVoyageurs. Retrieved 19 May 2016. ^ Dubois, Jill; Rosh, Mair (2004). Cultures of the World: Israel. Singapore: Marshall Cavendish. p. 122. ISBN 9780761416692. ^ Marks, Gil (2010). Encyclopedia of Jewish Food. Boston: Houghton Mifflin Harcourt. ISBN 9780544186316. ^ a b "Typical Israeli Breakfast: Bountiful". CBSNews.com. New York City. 6 November 2009. ^ Torgerson, Dial (6 September 1979). "Israeli Breakfast ... is being replaced by the continental breakfast: coffee and a roll". Sarasota Herald-Tribune. Sarasota. pp. 8–CF. Retrieved 7 April 2013. ^ Deane, Daniela (10 August 2012). "Smart Mouth: The delectable nature of Israeli breakfast". Washington Post. Washington, DC. Archived from the original on 28 July 2013. Retrieved 7 April 2013. ^ a b c d e f g h i Ashkenazi, Michael; Jacob, Jeanne (2003). Food culture in Japan. Books.google.co.jp. pp. 119–20. ISBN 9780313324383. Retrieved 29 June 2012. ^ a b Akiyama, Nobuo; Akiyama, Carol (1999). Learn Japanese (Nihongo): the fast and fun way. Books.google.co.jp. p. 123. ISBN 9780764106231. Retrieved 29 June 2012. ^ Lane, Jo (28 February 2012). "A taste of Yangon: 6 must-try Burmese dishes". Travel Wire Asia. Hybrid News Limited. Retrieved 29 April 2012. ^ Thorington, Lance. "A Typical Filipino Breakfast". Foodeditorial.co. Retrieved 19 February 2019. ^ "Report Shows Eating Breakfast Helps Children's Adademic Performance" (PDF). Archived from the original (PDF) on 27 January 2012. Retrieved 29 June 2012. ^ "Fonterra takes fresh look at school milk – National – NZ Herald News". Nzherald.co.nz. 15 December 2011. Retrieved 28 March 2012. ^ Back to work, back to school ... back to breakfast! ^ Goldfarb, Anna (January 18, 2018). "What Is a Continental Breakfast, and What Makes It Continental?". Kitchn. ^ "Continental Breakfast Centers". Mount Holyoke College. Archived from the original on 30 December 2013. ^ "Danish Food Culture: Breakfast". Denmark.dk. Archived from the original on 30 December 2008. Retrieved 28 February 2009. ^ "Hidden milk shop in Athens(in Greek)" (in Greek). Dailysecret.com. Retrieved 28 March 2012. ^ Wintle, Michael (2006). "Diet and Modernization in The Netherlands During the Nineteenth and Early Twentieth Centuries". In Thomas M. Wilson (ed.). Food, Drink and Identity in Europe. Rodopi. pp. 63–84. ISBN 9789042020863. Retrieved 28 December 2012. ^ "Micul dejun în lume - unde și ce se mănâncă dimineața". Știri pe surse. Bucharest. 20 May 2015. ^ "Ce consumă românii la micul dejun. Studiu Ipsos Research". economica.net. Bucharest. 14 February 2014. ^ "Clătite la micul dejun, noul trend în nutriție". 30 August 2013. ^ Iosebashvili, Irakli (4 December 2009). "Russia's national cuisine: Oladi pancakes". The Daily Telegraph. London. Archived from the original on 23 April 2012. ^ "Zopf: the Sunday joy". MySwitzerland.com, Switzerland Tourism. 2018. Retrieved 18 February 2018. ^ Mike MacEacheran (14 August 2017). "How Switzerland transformed breakfast". BBC Travel. Retrieved 18 February 2018. ^ "Spread over centuries" (19 August 2003). The Age. 10 June 2015. ^ Spencer, Colin (2003). British Food: An Extraordinary Thousand Years of History. Columbia University Press. ISBN 978-0-231-13110-0. ^ "Scott's Porage – Our Heritage". Scott's Porage Oats. Archived from the original on 23 September 2010. Retrieved 19 October 2010. ^ "Difference between Continental and English breakfast". Travelwebdir.com. 8 October 2007. Archived from the original on 2 November 2011. Retrieved 28 March 2012. ^ "Foods | The Canada Guide". The Canada Guide. Retrieved 16 January 2018. ^ Charles L., Cutler (2002). Tracks that speak: the legacy of Native American words in North American culture. US: Houghton Mifflin. p. 28. ISBN 0-618-06510-5. Retrieved 26 September 2012. ^ Emina, S.; Eggs, M. (2013). The Breakfast Bible. Bloomsbury Publishing. p. 110. ISBN 978-1-4088-3990-4. Retrieved 23 May 2016. ^ "Argentinean breakfast: tostadas and medialunas". therealargentina.com. Retrieved 16 January 2018. ^ a b "What Brazilians Have for Breakfast". The Brazil Business. Retrieved 16 January 2018. Kealey, Terence (2016). Breakfast Is a Dangerous Meal: Why You Should Ditch Your Morning Meal for Health and Wellbeing. London: Fourth Estate. ISBN 978-0008172343. OCLC 994867927. Wikimedia Commons has media related to Breakfast. Look up breakfast in Wiktionary, the free dictionary.